For some reason, the Holy Ghost seems to be one of the most misunderstood persons out of heaven. People seem to understand God, Jesus, even angels, and devils, but when it comes to the Holy Ghost they freeze up. But what you need to know is that the Holy Ghost is what we all need to live a life of holiness according to the mandates of the Bible. According to Unger’s Bible Dictionary, holiness is a general term that indicates sanctity, or separation from all that is sinful, or impure, or morally imperfect. It means moral wholeness. It is also one of the central attributes of God. Through man’s disobedience to God’s commands, he lost the most important feature of God-his holiness. Sin absolutely destroyed holiness in man. Jesus’ death and ascension to Heaven made it possible for us to regain a right relationship with God, but it is the Holy Ghost that helps us to live for God. The Holy Ghost is the third member of the Godhead. He has the power to change, to totally transform any individual from a person that God cannot have fellowship with to one that is totally pleasing unto Him. Whether the problem in an individual’s life is drugs, fornication, stealing, even murder, that is nothing too hard for the Holy Ghost to change. It’s the Holy Ghost that makes the difference. A good example of the ability of the Holy Ghost to change lives is found in the word of God. The Apostle Peter was a fisherman by trade. He was known by several names in the Bible, including Simon, Simon Peter and, in Matt. 16: 17, Simon Barjona or Simon, Son of Jon. Peter was a lying, cussing, fighting fisherman who was brash, outspoken and just a bad actor. When Jesus was taken into captivity in the Garden of Gethsemane, it was Peter who cut off a man’s ear with his sword. Peter denied Christ three times just as Jesus told him he would. But after he received the Holy Ghost he was a totally changed man. Peter went on to become one of the greatest of the Apostles, used of God to cause many to be saved and filled with the Holy Ghost. Jesus promised that He would send the Holy Ghost and one hundred and twenty people gathered together awaiting the arrival of the Holy Ghost. They believed the promise and were there to receive it. Suddenly the Holy Ghost made that promised arrival. 2 And suddenly there came a sound from heaven as of a rushing mighty wind, and it filled the entire house where they were sitting. Just as Jesus promised, the Holy Spirit came. The Holy Ghost is still present in the earth and He is here to help us, just as He has helped countless others. When we receive the Holy Ghost, we can always depend on Him to lead, guide, protect and comfort us. He’s here to help us to live a holy life, free and separated from sin. The Bible tells us that when the Holy Ghost arrived, the one hundred and twenty people who were waiting spoke in other tongues. Tongues are the Bible evidence that the Holy Ghost has arrived. Comedians laugh and make fun of those who speak in tongues. Some who do not speak in tongues doubt that tongues are real and others even reject their necessity. Some Saints have gone so long since they’ve spoken in tongues that they need to question whether or not they still have that joy. Some need a re-filling because of their neglect. But no matter what others may say, none of that matters because – no tongues? No Holy Ghost! You can love God and live as clean a life as you know how. You can desire to receive the Holy Ghost. You can even believe that it is necessary to have the Holy Ghost in order to be saved. But if you have not received the Holy Ghost you still don’t have it. But the good news is, you don’t have to be a fake or phony, you can get it. I can imagine that it is particularly hard for some individuals who have been saved for some time to admit that they have been functioning without the Holy Ghost. What does it matter now that God has opened your eyes to the truth? Just be grateful that you came into the knowledge that you need the Holy Ghost before it was too late. Get rid of that foolish pride and get all that God has for you. The Bible tells the story of a man who truly loved God, but did not have the Holy Ghost. His name was Cornelius and his story is chronicled in the 10th chapter of Acts. Cornelius realized at God had a blessing for him and he sent for Peter as he was directed. He did not argue with the angel that he had all that he needed from God, he just obeyed God. When Peter preached, the Holy Ghost fell upon Cornelius, his family and his close friends and they all spoke in tongues. Acts 19:1-7 relates another instance in which the Holy Ghost was given, this time through the laying on of hands. There are some who don’t believe that it is necessary to receive the Holy Ghost. They often state that the thief on the cross was immediately in Paradise with Jesus. I suppose that if God decided to take us to heaven immediately after He saved us, we would not need the power to live holy that the Holy Ghost brings. But, if you live one minute after salvation you need the Holy Ghost because you have an enemy named Satan, who will do what he can to overcome you. 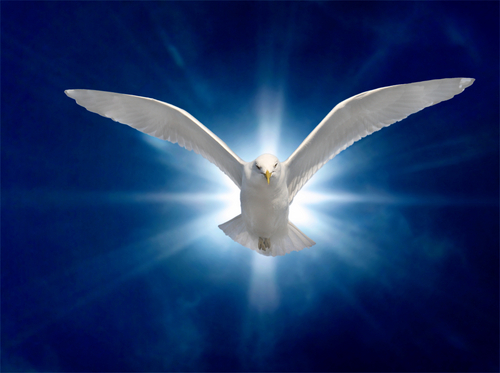 And for that final group of people who believe that the Holy Ghost is an option, did you know that the Holy Ghost appeared to Jesus and rested upon Him in the form of a dove at the time of His baptism? Receiving the Holy Ghost is a real event. It is an actual occurrence. Please do not settle for some nebulous thought or suggestion that you received the Holy Ghost when you repented. The Baptism of the Holy Ghost is the second act of grace that follows repentance. If you really understood how important the Baptism of the Holy Ghost is to eternal salvation you would be clamoring to get it. If you do understand its importance you will act on that knowledge. Let me tell you a quick story about one of my granddaughters, Gabby. Gabby was about 4 or 5 years old when she decided to help me at church. As one of the nurses, it is my responsibility to help when First Aid needs arise among the congregants. That particular Sunday morning Gabby came to sit with me and to “help” with First Aid. Out of the blue, Gabby turned to me and announced, “Granny, I’m going to be a nurse when I grow up”. I responded, “That’s great, Gabby”. A few minutes later, she whispered, “Granny, I’m already a nurse”. A little taken aback, I replied, “Oh, that’s good news. Then I’ll have to call you Nurse Gabby”. She said, “OK Granny.” A few minutes later a child came along that needed a Band-Aid for a minor cut. I said, “Nurse Gabby. Let’s go and fix this cut.” Her eyes got very large and filled with tears as she said. “Wait, Granny! I’m a phony! I’m a fake! I’m really not a nurse and I don’t know how to fix that cut.” Needless to say, it was all that I could do to keep from howling with laughter as my little Fake Nurse admitted to her real non-nurse identity. I relate this little story because it is similar to how some people respond when you ask if they have received the baptism of the Holy Ghost. Some have convinced themselves that they received it when they believed in Christ and accepted Him as their Lord and Savior. What they don’t seem to understand is that acceptance of Christ makes you eligible for the baptism of the Holy Ghost but until it happens it has not happened. The baptism of the Holy Ghost is the second act of grace that follows salvation. Let’s think about the facts for a moment. If it were true that we receive the Baptism of the Holy Ghost at the same time that we are saved, then the twelve men that Christ chose as His disciples should have received it during the three years that they walked with Christ. They lived with Him, ate with Him, some were rebuked by Him and they were prayed for by Him. Yet, what happened when he finished His time on earth and was ready to return to heaven? He told them to gather at a particular place and wait for the arrival of the Holy Ghost. You do not have to be a fake or a phony, pretending that you have the Holy Ghost when you don’t have it. You can have the real thing. Luke 11: 9-13 tells us how to receive it. The Power of the Holy Ghost. Once we have confessed our sins we have to receive the power to resist a return to that sin. That power comes only through the Holy Ghost. Not only must you be a witness for the Lord but you have to live a life that is pleasing unto God. No matter what your denomination, you have to live holy. God is a holy God who requires that we, his children, must also be holy. Several scriptures support this concept. For I am the LORD your God: ye shall therefore sanctify yourselves, and ye shall be holy; for I am holy. Just as the Holy Ghost was able to change Simon Peter from a cussing, lying, brash young man into a bold, Holy Ghost-baptized man of God; he can do the same for you. Jesus knew when he left here that we would need the power of the Holy Ghost in order to live as God told us to live. Peter messed up so badly that He actually denied Christ before he was baptized with the Holy Ghost. But after he received the infilling of the Holy Ghost, he was the solid rock that he was meant to be. Please know that there is nothing too hard for the Lord. Even if you have been stumbling over a particular problem or sin in your life, the Holy Ghost has the power to fix that problem. Get the power of God in your life. You need it to make it into the kingdom of God. God has a plan for each of our lives. We need the power of the Holy Ghost to bring that plan to fruition. Previous Jesus asks: “Do You Need Me To Do It Over Again”? This is an excellent explanation of the Holy Ghost. I certainly will share it in witnessing. Sis Alfreda….I loved this blog….I think many people miss the point that we need God’s spirit in order to live God’s commands. Doing it on our own brings only failure and self-condemnation. Asking for the Spirit to help us do what we really wanna do is the only way…. We all need the Holy Ghost! I liked reading the Promise, Purpose and Power of the Holy Ghost. It is very important to understand about the Holy Ghost. I remember being a new convert, I had questions about having the strength to continue in the faith. You have made it very clear the purpose of the Holy Ghost. Looking forward to reading more. Thank you Frances for your comment. Do you have any specific questions that I have not answered in the post?